An eclectic blend of cinematic downtempo, stylish lounge, sambas and easy-tempo sixties European pop music with an adventurous flair. Artists you'll hear include Piero Piccioni, De-Phazz, Seks Bomba, Shirley Bassey, Henry Mancini, William Orbit, Yoshinori Sunahara, Martin Denny and Walter Wanderly. 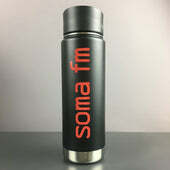 The SomaFM Stealth-matte black vacuum-insulated Klean Kanteen Wide 20oz! Great for keeping your coffee warm all day or your iced cocktails cold in the heat. Whether you use if for water, coffee, beer, bourbon, smoothies, kombucha or whatever your favorite drink is, it will keep it at the right temperature. Get yours with a $80 (plus postage) donation.